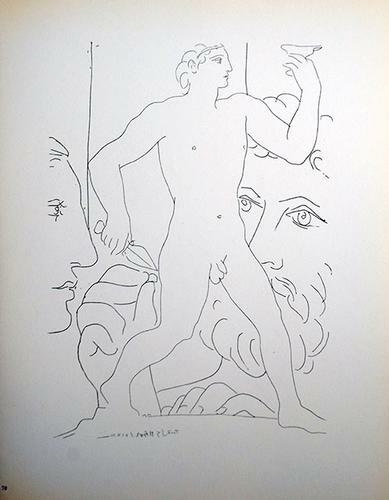 Very collectible limited edition vintage print gravure after the original etching by Pablo Picasso for the famous 'Picasso for Vollard' suite. This artwork was published by Harry N. Abrams, New York in 1956 and printed by Verlag Gerd Hatje in Stuttgart, Germany. Between 1930 and 1937 Pablo Picasso created 100 etchings for Ambroise Vollard, considered among many, as the greatest art dealer and publisher of our time. This suite is considered the most significant achievement of Ambroise Vollard. This print gravure is highly desirable due to its age, and the distinction acquired by both Pablo Picasso and Ambroise Vollard through their respective fields. The actual image size is approximately 7.5x10 inches and comes unframed.